Forest water use estimates derived from sap flow measurements in three contrasting regions of south-eastern Australia were compared. In each region, annual evapotranspiration was highly spatially variable, influenced by water availability, potential evapotranspiration, soil depth and texture, groundwater depth and salinity and at one site by species. 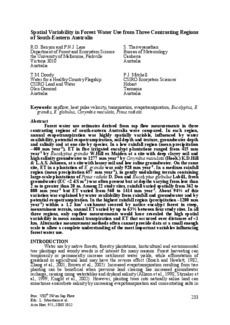 In a low rainfall region (mean precipitation -400 mm year-1), ET in five irrigated eucalypt plantations ranged from 415 mm year-1 by Eucalyptus grandis W.Hill ex Maiden at a site with deep clayey soil and high salinity groundwater to 1277 mm year-1 by Corymbia maculate (Hook.) K.D.Hill & L.A.S. Johnson, at a site with loamy soil and low saline groundwater. On the same site, ET in a plantation of E. grandis was only 928 mm year-1. In a medium rainfall region (mean precipitation 657 mm year-1), in gently undulating terrain containing large-scale plantations of Pinus radiata D. Don and Eucalyptus globulus Labill., fresh groundwater (EC <2 dS m-1) was often present but at depths varying from less than 2 m to greater than 20 m. Among 22 study sites, rainfall varied spatially from 362 to 800 mm year-1 but ET varied from 560 to 1414 mm year-1. About 94% of this variation was explained by water availability from rainfall and groundwater and by potential evapotranspiration. In the highest rainfall region (precipitation ~1200 mm year-1) within a 1.2 km2 catchment covered by native eucalypt forest in steep, mountainous terrain, annual ET varied by up to 63% between four study sites. In all three regions, only sapflow measurements would have revealed the high spatial variability in mean annual transpiration and ET that occurred over distances of <1 km. Alternative measurement methods often cannot provide data at a small enough scale to allow a complete understanding of the most important variables influencing forest water use.